Of course. If you go off the trodden track on an expedition, so many things might go wrong. But that’s why it’s so much fun because you can not write the expedition report at the beginning. 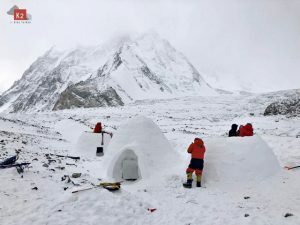 But you may also experience nasty surprises – like on your last expedition to Annapurna III this spring, where you spent five weeks more or less in bad weather. Nevertheless, we have not returned empty-handed. We have collected a lot of information about the project and we want to come back again. Next time we will do many things in another way and better. Maybe we are able to succeed. Often you have to approach to a goal by answering open questions. In difficult projects this can take several years. If I go on a frequently climbed mountain, I only need to google. One of the major unsolved problems in the Himalayas and Karakorum is the Northeast Face of Masherbrum (7,821 m) in Pakistan. 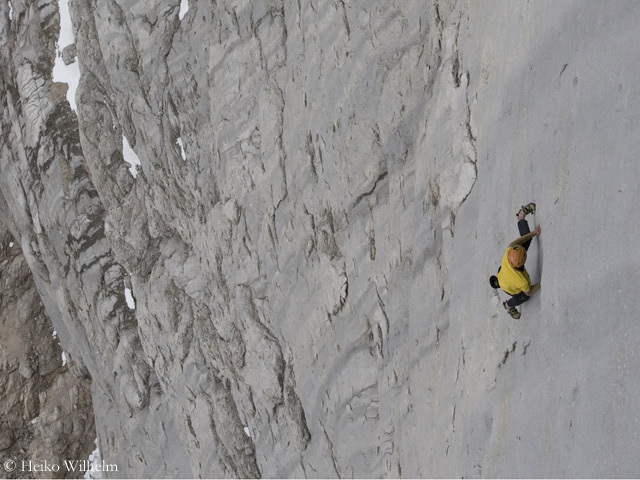 David Lama, Peter Ortner and you have tried it in 2014 but have not been able to advance much further than to the bottom of the wall. Do you have this project still in mind or do you concentrate on more achievable goals? 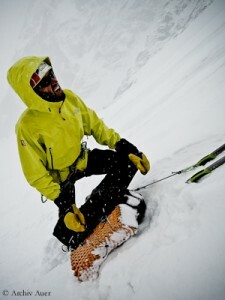 If you are constantly going on expeditions, you can not always try very, very difficult projects. You have also to choose projects that are manageable to find your confirmation by success. If you’re going somewhere year by year, where the odds are very low, it will wear you down in the long run. 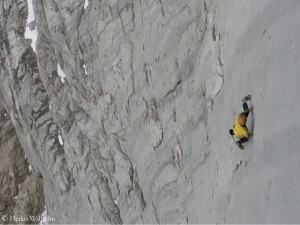 But the Masherbrum project is still alive. Whenever we meet, we talk about it. The date when we’ll try it again is still open. But for me it’s clear that the wall is not climbable on the direct line we had originally planed. We will have to compromise. 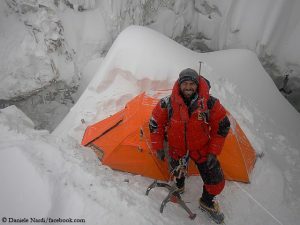 Masherbrum is really extremely dangerous. You can not try it every year. If you do so, you won’t come home someday. 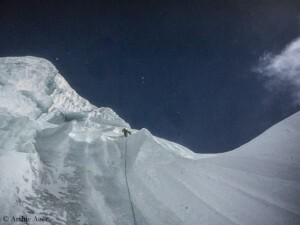 About a year ago, you first climbed the Southface of Nilgiri South (6839 m) in Nepal, along with Alex Bluemel and Gerhard, called “Gerry” Fiegl. Gerry suffered from high altitude sickness and fell to death on the descent from the summit. Do you, for this reason, post the expedition as failed? Of course, it is not a successful expedition, because that would mean that all climbers, who set off, later returned. We can not undo this accident. It was one of the saddest moments of my career. If a friend with whom you started to climb falls to death right in front of your eyes, it is horrible. But even on the summit, we hadn’t any feeling of happiness because we realized that something was wrong with Gerry. We had to traverse the summit because the descent via the ascent route was much too difficult. We had hoped that Gerry’s condition might change for the better due to the euphoria of having reached the summit. And we managed to descend relatively far down. But in the end the accident could not be avoided. 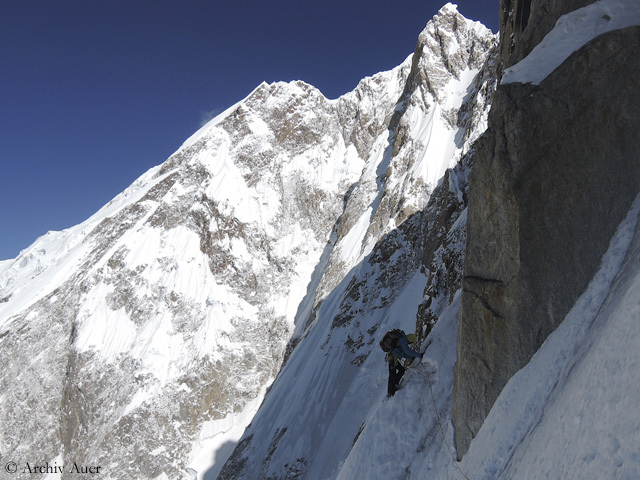 These difficult climbs in high altitude are only possible by reduction: reduction of equipment, of weight – and of safety too. There is simply no longer a large safety buffer. The public quickly forgets such accidents. But you have to live with it. Is it possible at all to come to terms with such an event? I believe you can not forget it for the rest of your life. You are shaped by such an extreme experience. Gerry will also be missing in ten years. There are many memories, because we were so often together en route. It’s quite normal that the public forgets. But we don’t want to forget it. We have to accept it in a certain way. We were given someone with whom we were allowed to take many actions. We would have liked to do it longer, but maybe it was predetermined and just had to happen this way. Has the incident made you more cautious? It was, of course, a dramatic experience. It has made me reflecting about myself, but my basic personality is not so extremely influenced that I would say: I stop it. Finally climbing is my life. 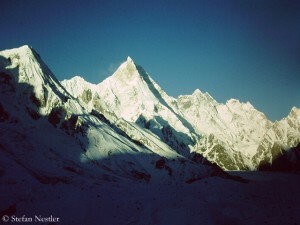 Of course, it was not easy to go on expedition to Annapurna III last spring. 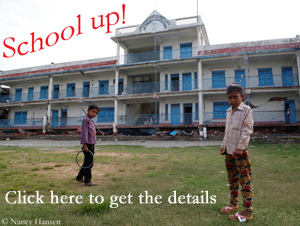 The moments are the same: the airport in Kathmandu, the hotel, the base camp. The mountain is located not far from Nilgiri South. And we have set off for climbing Annapurna III on the day exactly half a year after Gerry’s fall to death. You can not simply fade out these memories. You are moving on a narrow ridge doing these extreme projects. 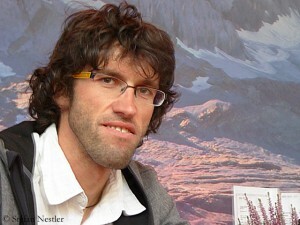 If you climb free solo (Hansjoerg i.e. made headlines worldwide when he climbed the difficult Fish route through the South Face of Marmolada in the Dolomites for the first time free solo in 2007), almost any mistake inevitably would lead to death. Do you feel how far you can go? I have started very early to climb solo. I have a good feeling for that. And only in this case I really do it. In high altitude it is much more difficult, because things can happen which you don’t expect. If you have not experienced it by yourself, it is, for example, hard to imagine how fast high altitude sickness can develop. Up there you are not allowed to live out your ambition excessively because that can lead to death. You have to be more honest with yourself than in the Dolomites or other mountains of the Alps. In other words, you have to learn to put the brakes? You have to know when it is enough. Of course I can not turn around at the first sign, otherwise I would never get far. But I must have to realize if it was the last sign. The projects are created in your head, you are planning them for a long time, you focus on them. Do you still have the sense to perceive the country and the people on your expeditions and to enjoy the fact that you are traveling in a foreign world? Honestly, mostly not. I am so focused on my projects that there is little time left. But I have started to travel once a year, always in December, to a city in Europe for a weekend, without climbing equipment, simply to visit it. For me, this is a big step. Not only mountains, walls, shadow, ice, snow and rock. If you are constantly en route for many years, you have to be careful not to lose your footing. You are so focused on your projects that you begin to believe they are necessary for life. You return from an expedition and feel that everyone should be interested in it. Of course adventure stories are always interesting, but you have to keep both feet on the ground and be aware: There are other important things. 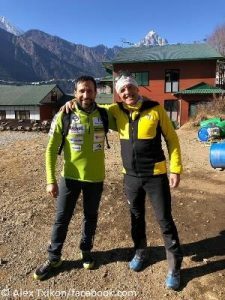 Nepalhilfe Beilngries Manaslu Elisabeth Revol Mount Everest Annapurna Thomas Huber Billi Bierling K2 Thulosirubari winter expedition Avalanche Expeditions first ascent Alex Txikon Earthquake Dhaulagiri Tomek Mackiewicz Cho Oyu Tamara Lunger Kangchenjunga K 2 Pakistan Shishapangma Daniele Nardi winter ascent Lhotse Nanga Parbat Expedition Makalu Karakoram Mingma Gyalje Sherpa Ueli Steck Amical Alpin Tibet Nepal Ralf Dujmovits Simone Moro Luis Stitzinger Broad Peak Aid project: School up!